More than half a trillion isk worth of carebear ships, modules, and implants have been destroyed in the name of the New Order. Everyone loves the juicy kills, such as those featured in the MinerBumping "Kills of the Week" posts. And yet, no violation of the Code is too small to escape punishment. Among my rebel critics, it's something of a minor scandal that I and other Agents of the New Order enjoy the occasional Venture gank. There are many good reasons why someone might want to kill a Venture. 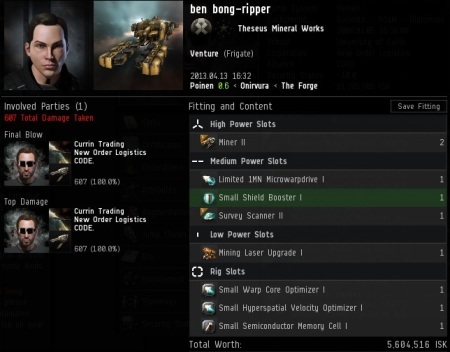 They're useful for generating Concord, they sometimes have decent implants, they're convenient to kill even in the absence of a proper warp-in (using 125mm Railgun Is you have plenty of range). 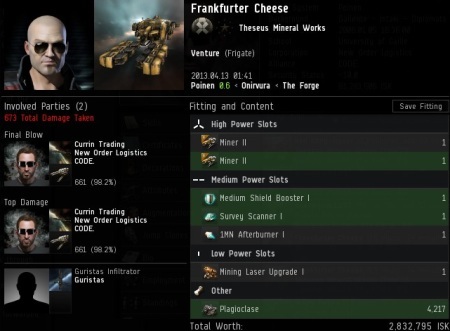 If that weren't enough, Ventures deserve to die because their ship design seems out of place, compared with the graphics of the rest of the ships in EVE. Venture pilots also yield good tears. However, the most important reason to kill Ventures (and if possible, to pod their pilots), is that it helps new players. New players are often the most willing to learn new things about the game; they have spent less time being brainwashed by carebears. Wreckzz is new to the game, and he seems to "get" EVE. 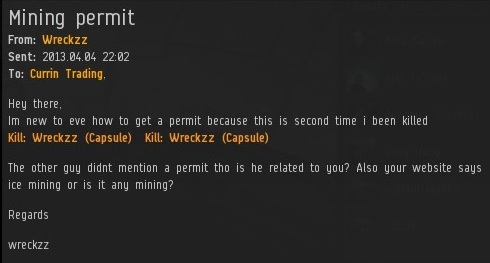 But if he had spent a lot of time around highsec miners, maybe he wouldn't. 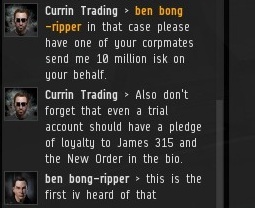 When I was sent a convo request by ben bong-ripper, I accepted it as I do all others. Ah yes, the Venture pilot I had killed a few minutes earlier. No wonder his name sounded familiar. In the beginning, it sounded like another one of those "you should warn me before you kill me" type of complaints. Then I learned that ben was a brand-new player. This was a critical moment. Enemies of the Order frequently accuse us of being bullies who prey upon the weak. 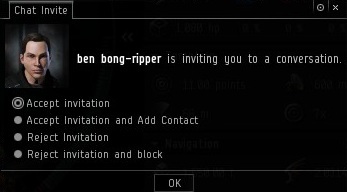 So how would the Saviour of Highsec respond to a situation where he uknowingly ganked a freshly-minted player? With kindness, patience, and compassion--that's how. The New Order isn't just about killing people or controlling them, it's also about teaching them. Much of the time this is done through the process of reeducation, to help miners un-learn bad habits, escape self-destructive patterns, and to break the cycle of bot-aspirancy. But with brand-new players, reeducation is replaced with regular ol' education. They're learning what EVE is about for the first time. As I explained the facts of life to ben, I was troubled by the fact that his so-called corpmates had left him on his own. 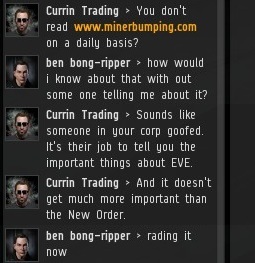 EVE is known for its "learning cliff", which is why it's a shame so many EVE players today lack mentors. It's a good thing that they have a Father of the New Order who cares for them. I gave ben step-by-step instructions on how to make a bio. ben was very grateful for my help, and proudly showed off his new bio. The story had a happy ending. It's easy to overlook the little guys, the underdogs of highsec. The New Order doesn't leave them in the gutter, it lifts them up. By now, everyone knows our motto: "No miner left behind!" 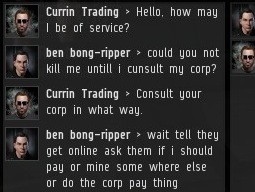 This seems to be that kind of Corp that should be wardecced into oblivion... for the good of their members. And I am not being sarcastic here. Is his title really "Director"? as a trial? That's an opportunity waiting to be seized upon. Yes, it is. This new player needs to be taught all about AWOX, and how rewarding it can be. This is the proof that emergent gameplay is perfectly ok for new players. It's actually what draws many of them to EVE. The anti-New Order mentality is an acquired deficiency of old carebears. As a firm believer of the sandbox environment, I applaud you James. No I'm not a member of the New Order. 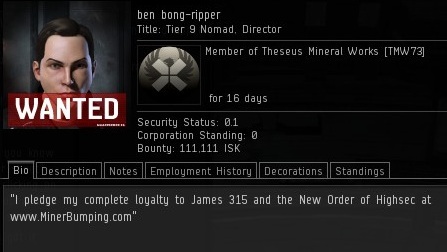 Just a resident of Null sec looking for a good read. This story is just as heart warming as the stories of your carebear tears. 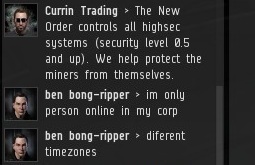 Someone should inform Ben, that he doesn't have to stay in a corp that is more active outside of his own time zone/shift. 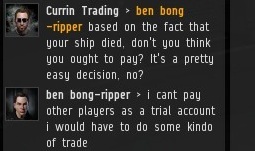 You raise an interesting point however; the entitled thinking behind "If I can't pvp you shouldn't kill me" is learned behaviour, an attitude instilled by the bad corps that got you in the mining ship so the corp could profit without the hard work required to properly teach its membership about ship fittings, tanking and gunnery formulas that results in their death and how to prevent it. To think some people want to do away with npc corps and have new characters assigned to player run corporations. While there are great corporations out there, not all of them are set up for that sort of belt-strapping teaching environment and even those that think they are should meet minimum requirements in ability and knowledge.